LANSING — The 2016 fight for control of the Michigan House of Representatives is the most expensive in the state’s history. Donors, political parties and outside groups poured at least $27.0 million into House races for 2016, according to the Michigan Campaign Finance Network’s (MCFN) review of campaign disclosures, broadcast TV ad-tracking data and hundreds of records filed on TV ad purchases with the federal government. The previous record price tag for House races came just two years ago in 2014 when it hit $25.4 million. Despite the record amount of spending, the partisan composition of the House didn’t change in the 2016 election. Republicans won 63 of the 110 seats in the 2014 election. They won the same number in the 2016 election (they lost one seat but flipped another). Democrats won 47 seats both times. — Spending by groups acting independently of the candidates’ campaigns jumped. MCFN tracked $2.32 million in independent spending for the 2014 House election. For 2016, MCFN tracked $4.36 million, an 87 percent increase. — Financial support specifically aimed at general election candidates also grew. In 2014, general election candidates had a total of $21.6 million in financial support. In 2016, they received $24.5 million in financial support, a 13 percent increase. — And more money than ever before flowed to the most competitive races. The top 10 most expensive races of 2016 attracted about $11.5 million. That’s about $2.5 million more than the top 10 most expensive races drew in 2014: $8.9 million. There were seven races that attracted more than $1 million each in 2016. The previous high for $1-million races came four years ago in 2012 when there were six. In 2014, there were only three. 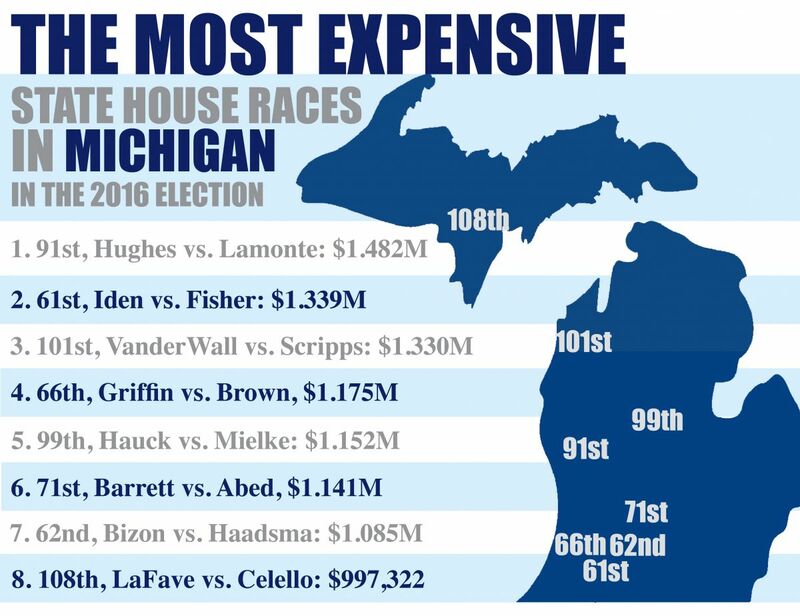 The 2016 election also saw the most expensive individual Michigan House race that's been tracked by MCFN. The 91st District race between incumbent Rep. Holly Hughes, a Republican, and former Rep. Collene Lamonte, a Democrat, drew at least $1.48 million. It narrowly beat out the 2012 race in the 71st District between Democrat Theresa Abed and Republican Deb Shaughnessy, which drew $1.40 million. 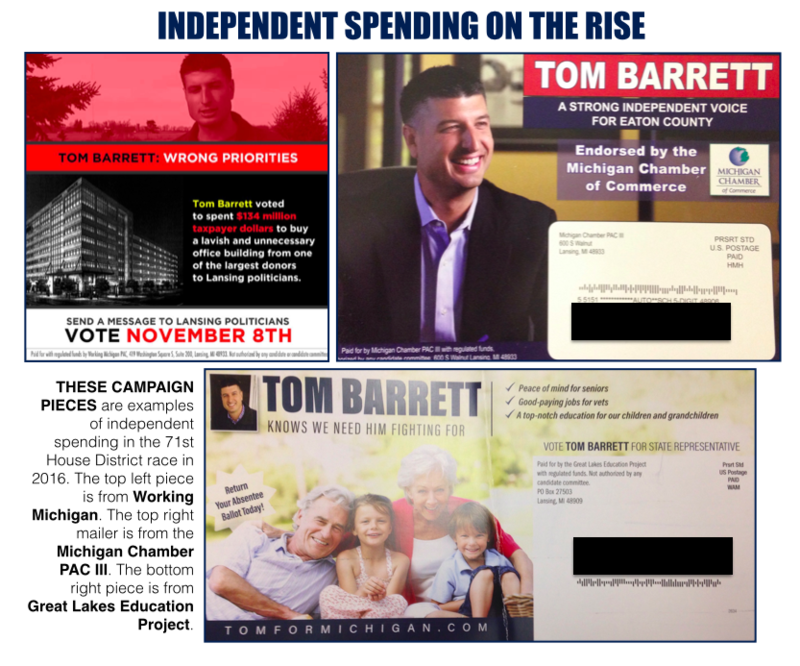 The figures include the financial resources the candidates’ campaigns had access to, independent expenditures disclosed to the Michigan Secretary of State and TV issue advertising — both broadcast and cable — that supported or opposed the candidates but didn’t specifically tell viewers how to vote. The numbers don't include payments for other unreported efforts to influence the election, like social media advertisements, robocalls and direct mail that can fall outside disclosure requirements if they don't expressly tell people how to vote. Such TV ads still have to be reported to the Federal Communications Commission (FCC). Some voters in competitive House districts reported receiving at least 35 pieces of mail about House candidates in the run-up to the election. The wide majority of spending on those mailers came from the state’s political parties. Based on ad-tracking data from Kantar Media and a review of thousands of disclosures filed by TV stations and cable systems with the FCC, MCFN tracked $2.42 million in issue advertising aimed at House races. Like the mailers, donors behind the ads don’t have to be disclosed. MCFN included only advertising purchases that the records indicated were aimed at House races. The wide majority of the TV ads came from three sources: the Michigan Democratic State Central Committee (about $1.29 million tracked); the Michigan Republican Party (about $961,000 tracked); and Making Government Accountable, a nonprofit corporation connected to Gov. Rick Snyder that doesn't disclose its donors (about $118,553 tracked). The figure from Making Government Accountable includes only ads that touted state House candidates, according to the records. The nonprofit ran many other ads that focused on only Snyder's record as governor. Independent spending in House races that was reported to the Michigan Secretary of State’s Office for the primary election and the general election totaled about $2 million. This was spending not controlled directly by House candidates themselves. The majority of that independent spending came from just six groups. Leading the way was Working Michigan, a labor-funded Super PAC, which reported about $376,717 in independent spending supporting specific Democratic House candidates. The five other top independent spenders all mostly supported Republicans. The Michigan Chamber of Commerce’s Super PAC reported about $254,305 in spending on House races. The Great Lakes Education Project, which supports efforts to expand school choice, reported $241,492. The Business Leaders for Michigan’s Super PAC reported $240,016 in independent spending. Michigan First, which was funded primarily by Senate Republicans, reported $231,362 in independent spending. 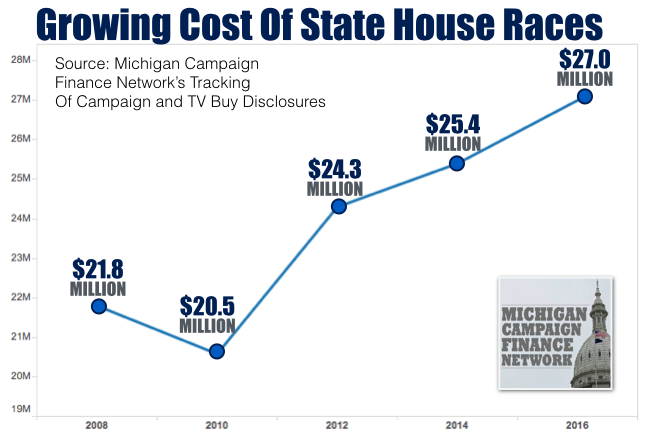 And the Michigan Freedom Network reported $227,816 in independent spending. Most of the groups’ spending was on mailers, paid advertising and door-to-door campaigning. Other independent spenders in 2016 included groups focused on specific policy matters. The Planned Parenthood Votes Super PAC reported about $151,000 in independent spending in House races. Right to Life of Michigan reported about $32,000. And the National Rifle Association (NRA) Political Victory Fund reported about $17,000. The NRA’s spending focused on distributing endorsement cards, like one that was sent out in the 106th District. “Sue Allor deserves your support and she needs your vote to win!,” the card said of Republican Sue Allor, who eventually won the 106th District seat. Along with the state parties, the caucus committees of the House Republicans and the House Democrats are the biggest players in competitive House races. Both groups spend heavily on TV advertising directly backing House candidates in competitive seats. The House Republican Campaign Committee reported $4.04 million in total spending over 2015 and 2016. The House Democratic Fund reported $4.22 million in total spending over the two years. Both committees raised more in the 2016 election cycle than they had in past cycles.